In 2016, Ryan and Arin Thompson felt a burden for reaching their friends and family with the Gospel in their hometown of Nederland, Texas. The Thompsons opened their home and began a community group in their living room. 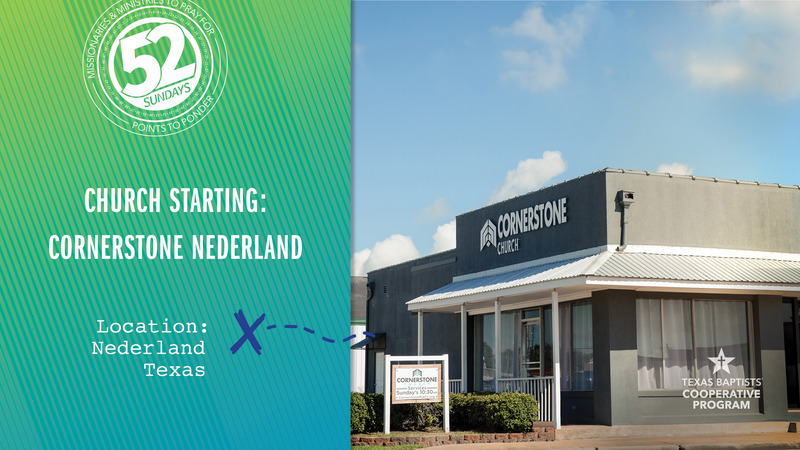 After months of meeting in their home, Ryan went through Texas Baptists Church Planting Center training and began laying the groundwork for Cornerstone Church. Two years later, more than 100 people meet each week in community groups to learn the essentials of discipleship, evangelism and growing in their faith. Our church’s gifts through the Cooperative Program help fund Church Planting Centers around the state, which train church planters to reach new areas and people groups in Texas with the Gospel. Let’s pray for Ryan Thompson, his family and Cornerstone Church as they continue to reach the lost in their community.